D&G Bus is the trading identity of Rolling Solutions Ltd and a sister company of Green Triangle Buses Ltd trading as South Lancs Travel. 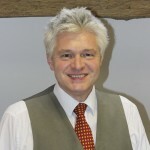 Both operations are owned by David Reeves and Julian Peddle though they have very different identities. 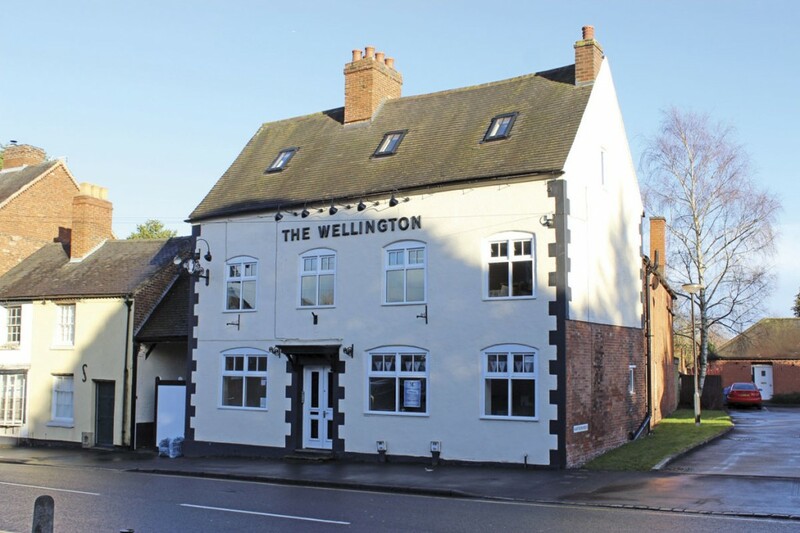 They have their head office facilities at The Wellington, a former public house on the High Street in Uttoxeter, Staffordshire, where I met David recently to hear about developments at D&G in particular. A Grade 2 listed property, the building was bought as a fire damaged shell in June 2013 and restored. The location suits David who lives nearby. 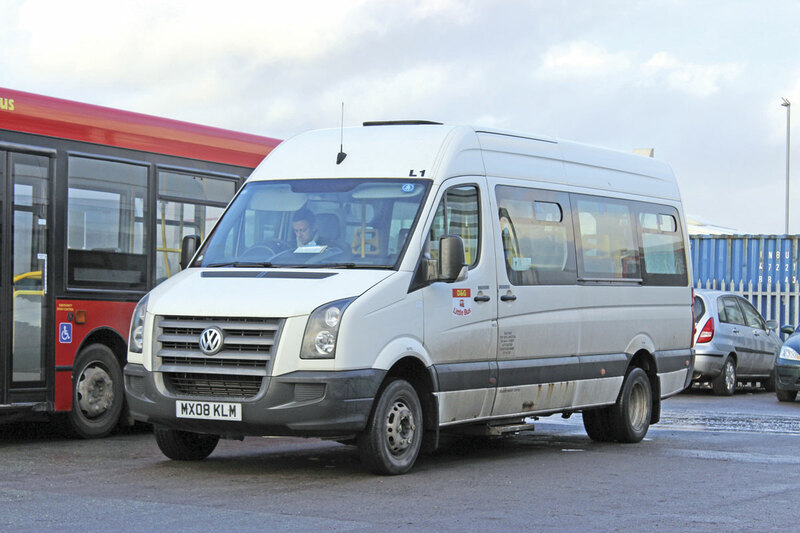 It houses the payroll and accounts functions for both businesses as well as the bus route and timetable planning and is home not only to David but also Chris Almond, Bus Network Manager, Heidi Holland, General Manager, Emily Huthwaite, David’s PA and Kelly Thomas who looks after the accounts. 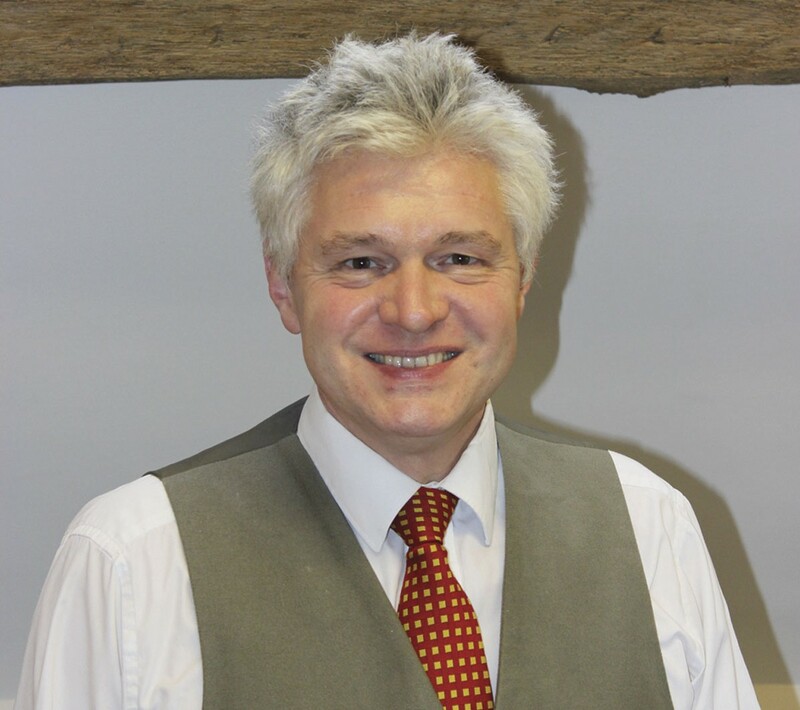 The operational management of the bus companies, including holding the traffic and engineering meetings, is at a local level, with Group Operations Manager, Kevin Crawford, floating between depots. 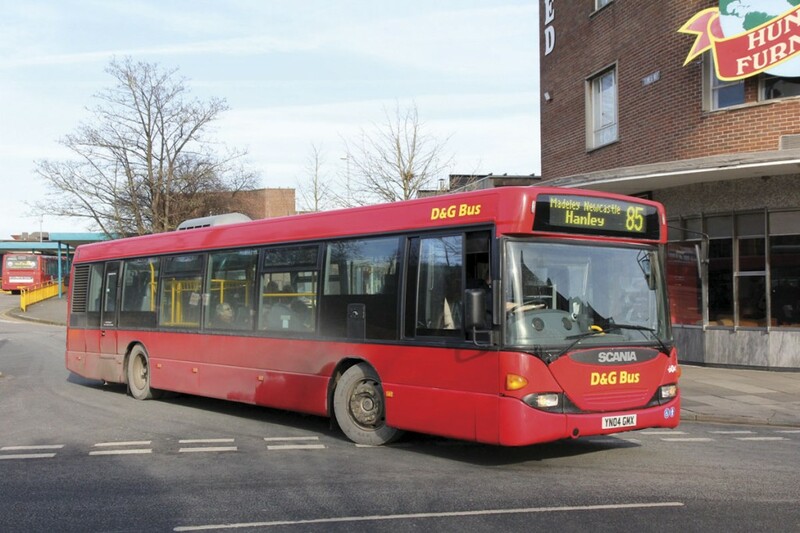 D&G was a relatively late entrant to the market, running its first four buses in 1998 on two tendered contracts for Stoke on Trent City Council. 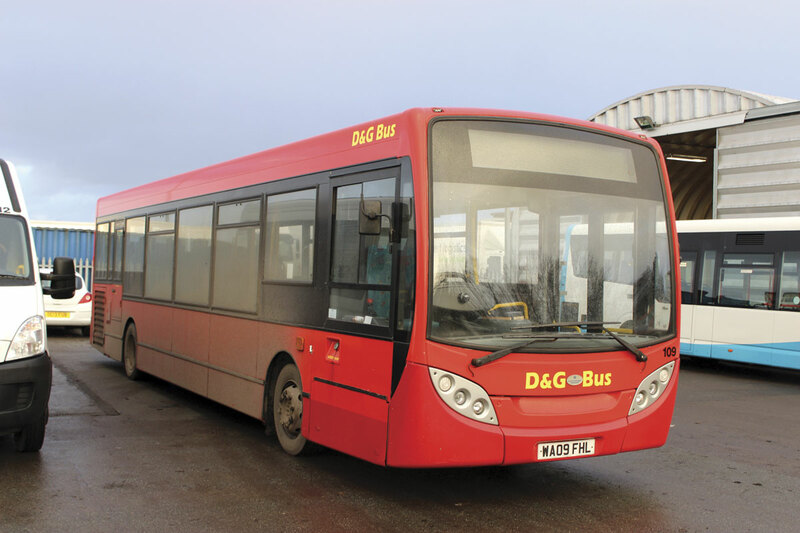 By the end of the first year they had 16 buses in operation, although it wasn’t for three years that David came full time into it, to work alongside his late friend and business partner, Gerald Henderson, the G of D&G. Sadly Gerald died in 2006, by which time D&G had developed into a significant operation with a new depot and a second operation in Crewe. I’ve covered the early years of the company in articles before, so I won’t repeat that here. 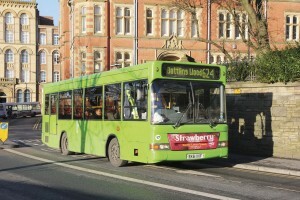 ‘Then the opportunity to buy Green Triangle Buses, trading as South Lancs Travel came up because Martin Bott and David Stewart wanted to do other things. We thought we could add a little to it and we bought it. With cautious optimism I can say that the business is doing very well. 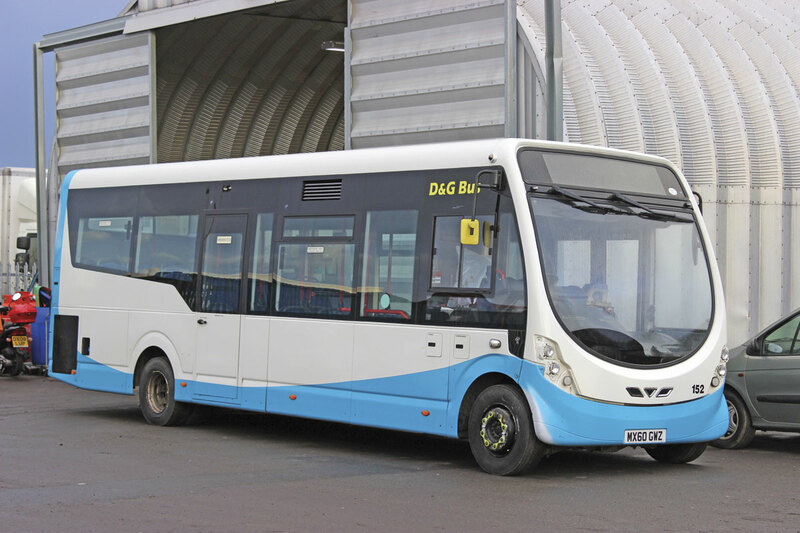 We’ve just bought four new Enviro200s.’ South Lancs Travel has a very different look to the D&G fleet, not least in the livery it uses which is an attractive combination of blue, yellow and white. The fleet can be seen across the area of its title, principally serving Leigh, Wigan, Bolton and St Helens. Having sold the Potteries business, Crewe became D&G’s focus. 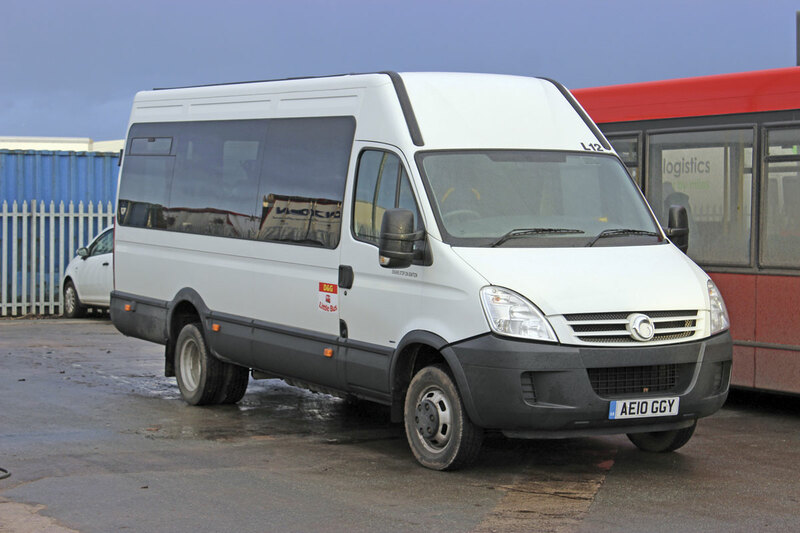 It currently has an allocation of 38 vehicles plus the D&G Little Bus fleet of 11 minibuses. 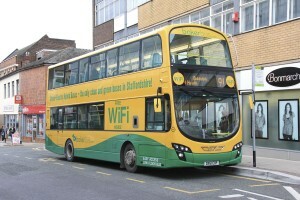 Most routes are commercial, developed by filling gaps in the network, but some are supported by Cheshire East Council or Staffordshire County Council. 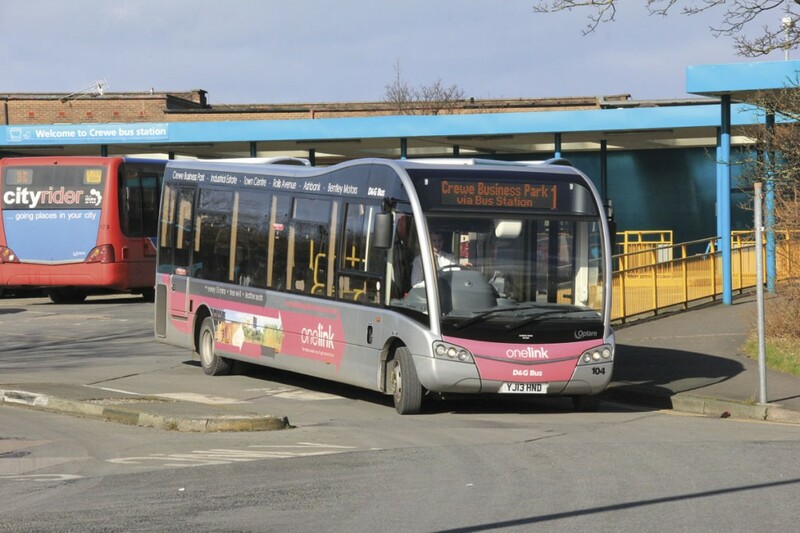 The majority of Crewe buses carry the standard two-tone red livery but four 2013 Solo SRs are branded in silver and pink for One1ink, a few are in Staffordshire County Council’s Plum Line and Cityrider liveries and one carries a Tesco Extra scheme. There is also a Solo out-stationed at Leek in Sainsbury’s colours. 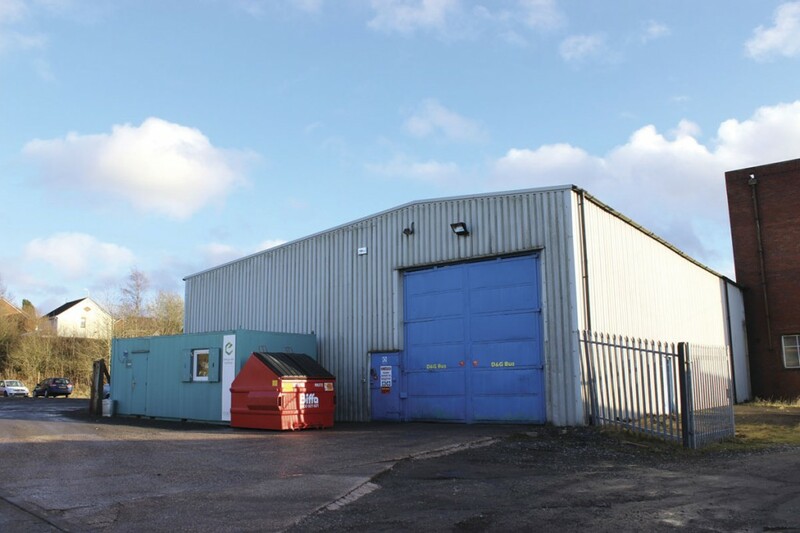 Crewe’s operations ran from a large and quite well appointed yard, the downsides to which were that it was rented and at an indeterminate point in the future it was going to be redeveloped. David did not like the uncertainty of not being in control and set about looking for a new base to buy. Although prepared to look within a 15 mile radius of Crewe he didn’t find locating somewhere easy, though in the end, the site purchased was only half a mile from the old one. Officially opened on 23 October 2014 by the Mayor of Cheshire East, exactly ten years after the start of D&G’s first operations in the town, it is a 1.25 acre site next to the railway off Cowley Way. On it a new three bay workshop has been erected, complete with rolling road, and a secondhand portable workshop building has also been acquired and set up. Four refurbished portable buildings with two stacked on top of each other, form an office complex with toilets, canteen, a meeting room, training room, and two offices. Room for growth has been built in to them although there is not a great deal of spare parking capacity remaining and the nature of the Crewe market is such that opportunities for further growth locally may be somewhat limited. 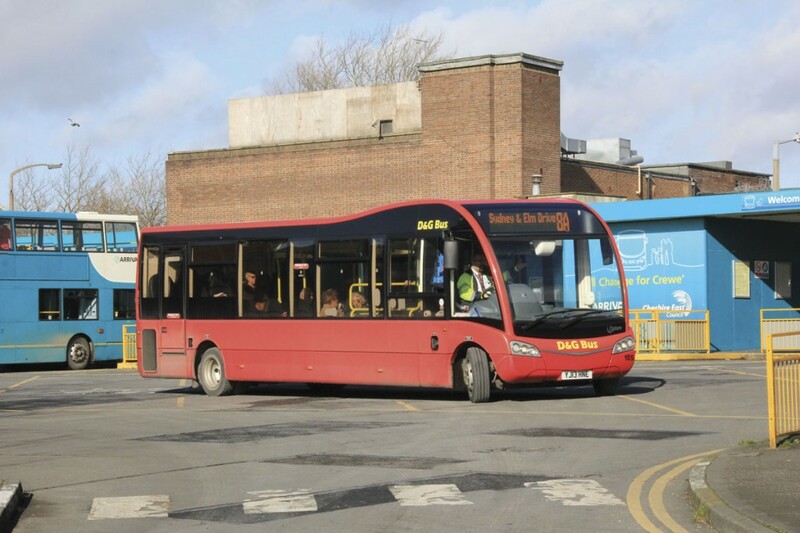 One expansion of the Crewe operation that occurred was the taking on of the Little Bus demand responsive minibus operation under a five year contract for Cheshire East. Initially operated with a PVR of eight minibuses, that has since grown, of necessity, to nine to fill a gap in the service network. It both provides a dial-a-ride type facility and enables the local authority to offer a service to areas where there are no other bus services. Passengers have to be registered in order to use the buses and they need to plan ahead and book the day before at the latest. Bookings cannot be taken on the day. It employs rather a mixed fleet including VW Crafters, Ford Transits, a couple of Iveco Dailys and a Mercedes-Benz Sprinter, because the vehicles are those formerly operated by Cheshire East. David admits that he had been trying to win the tendered contract for the 841 service from Uttoxeter to Stafford for around 15 years, continuing to try for it after the sale of the Stoke operation despite the distance from the Crewe depot, which was factored in to the bid. It came as something as a surprise when the route, with a PVR of three, was won last year and rather than run it from Crewe, it was decided to establish a small depot in Uttoxeter. Soon afterwards First reduced the frequency on a trunk route linking Newcastle-Under-Lyne with Meir via Stoke, Fenton and Longton from every ten to every 20 minutes, prompting David to register a new four bus operation that operated between First’s remaining runs to reinstate the original frequency. It started running on 30 October. 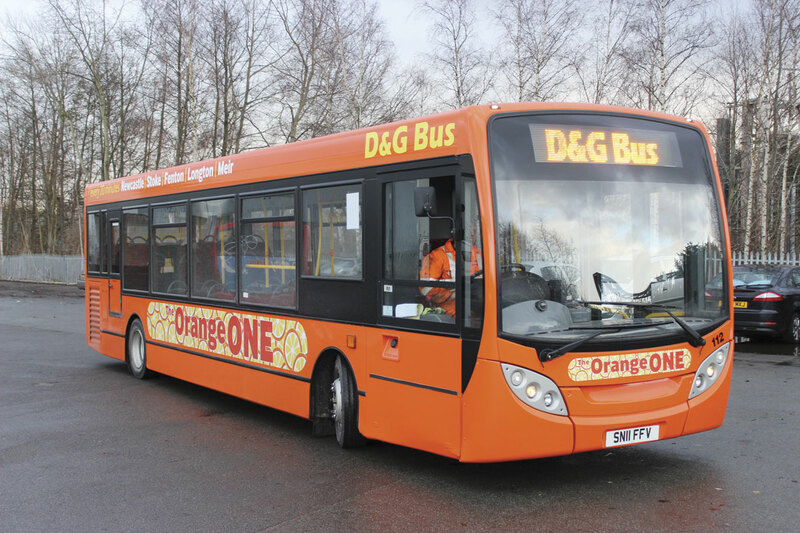 The new route was branded ‘The Orange ONE’ and given a distinctive bright orange livery which is relatively unusual for commercial routes run by D&G, most of which feature the all over red livery. 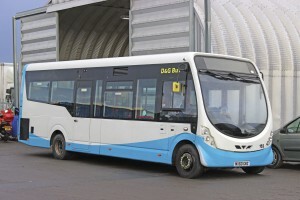 Three late Enviro200s were purchased in an online auction and a used Solo was also acquired. So far, D&G are ‘reasonably pleased’ with the performance of the ONE. ‘It’s not stunning but it’s there or thereabouts. It’s built up a steady degree of patronage,’ said David. The Orange ONE started and finished in Longton and this was a significant factor in a decision to move from the Uttoxeter depot and establish a depot on the Cinderhill Industrial Estate in nearby Meir for the allocation of both the ONE and the 841. The move took place a couple of weeks ago and work on adapting the facility has yet to be completed, but it will house nine buses and an engineering facility. 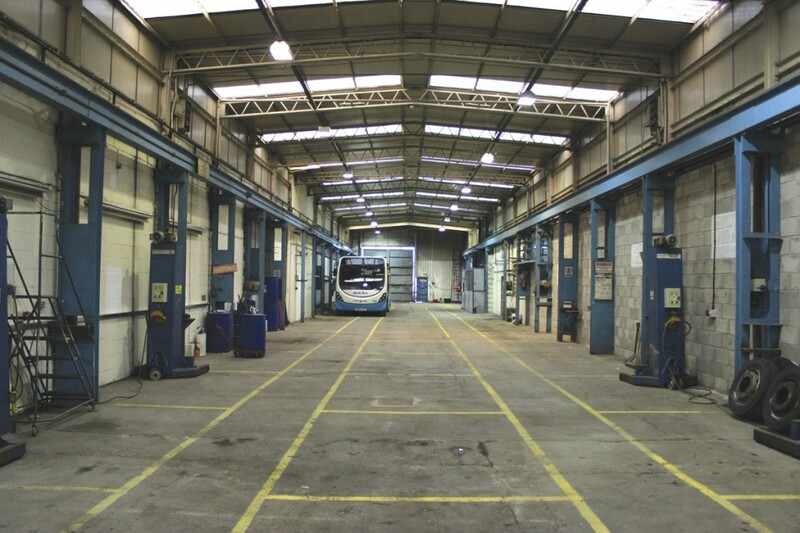 A small yard provides space for more buses and driver’s cars. David, who likes owning property, though the Cinderhill site is rented, admitted he had previously tried unsuccessfully to buy the former Procters depot site in Fenton when they closed down. 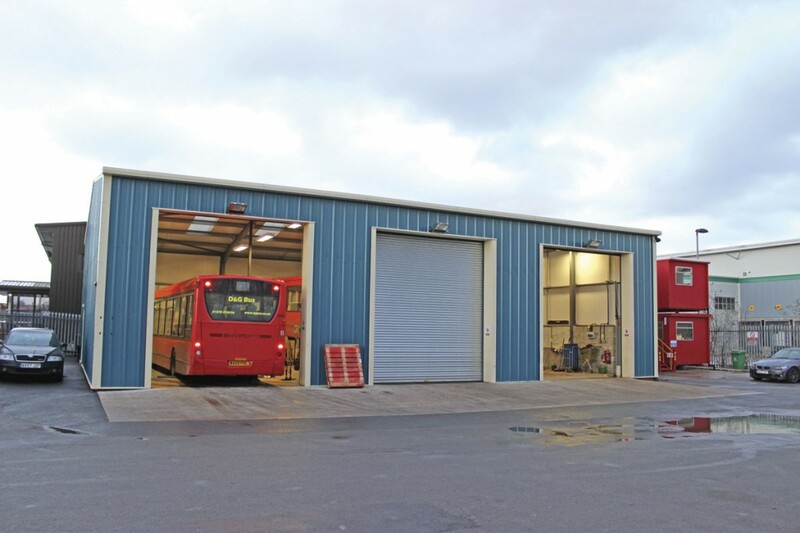 No sooner had the new depot been identified than the chance to buy the bus operations of BakerBus came up. D&G was not offered the former Bakers coach and travel operations but would not have been interested anyway because the company preference is not to get involved in coach operation. Negotiations were complicated but a deal was eventually completed and Baker’s routes taken over with effect from 11 January. Included in the deal were nine buses. These included seven Wright Streetlites, a Solo and a DAF SB120 Wright Cadet. ‘It’s the first time we’ve operated Streetlites so we’ll see how they go,’ said David. David praised how the BakerBus management looked after the staff who were transferring. ‘They went out of their way to do so,’ he said. With less than a week of operation under their belts when I visited it was too soon to say how the services were doing, but he was pleased with the drivers who had come across. Bakers’ former services are quite a mixed bag. Registered to Rolling Solutions (trading as D&G) from 11 January were the X15, Plumbline, 101, 99, 94, 10A, 9, 74A, 27, 17A and 423. The main attractions are the 9 service between Biddulph, Bradeley and Hanley and the 94 linking Congleton and Newcastle via Biddulph, Tunstall and Wolstanton, both of which have a three bus PVR. Also included are the tendered 423/424 in Biddulph, the SB123 Sandbach town service and the 5 and 6 in Macclesfield. With the additional buses, the new Meir site is already pretty much up to capacity. 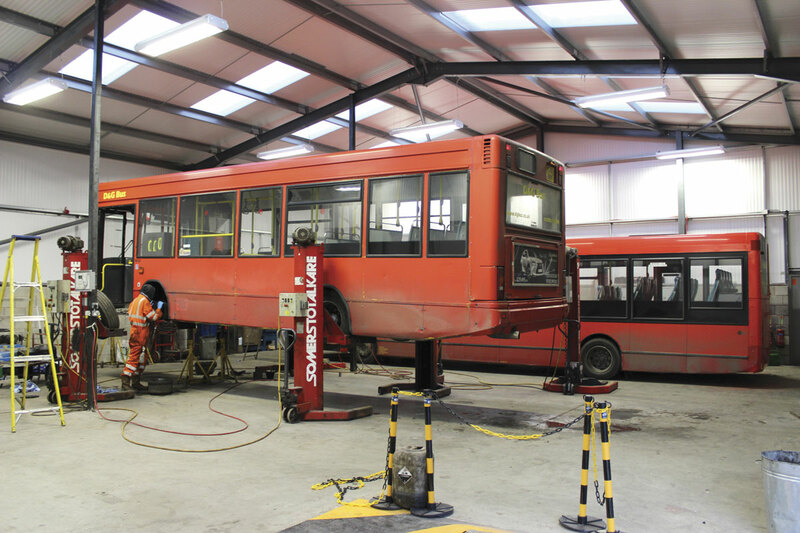 Although the current operation is going very well, there are always opportunities and risks with entrepreneurial ventures and David has been involved with other bus operations, either though D&G or personally, that are no longer owned. The disposal of the original Potteries operation is an example of this. 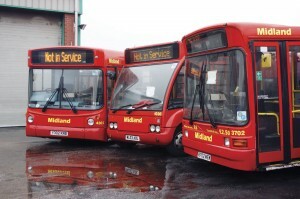 Another is the Midland business, based at Darlaston in the West Midlands. 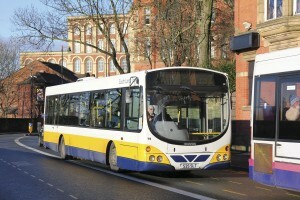 Bought in 2006, it was sold in September 2012, also to Arriva, for several reasons. ‘Operationally it had been loss making but it had turned to profit. The accounts for the last couple of years were very healthy. Operationally we were there or thereabouts. Arriva saw it as an opportunity for growth because they wanted to get more in to the West Midlands market. We saw that if they were determined to increase their presence through the tender market then the value of tenders may have gone down. The price offered was reasonable, so we decided to withdraw gracefully and move on to other things,’ said David. In some ways less successful was Strawberry. 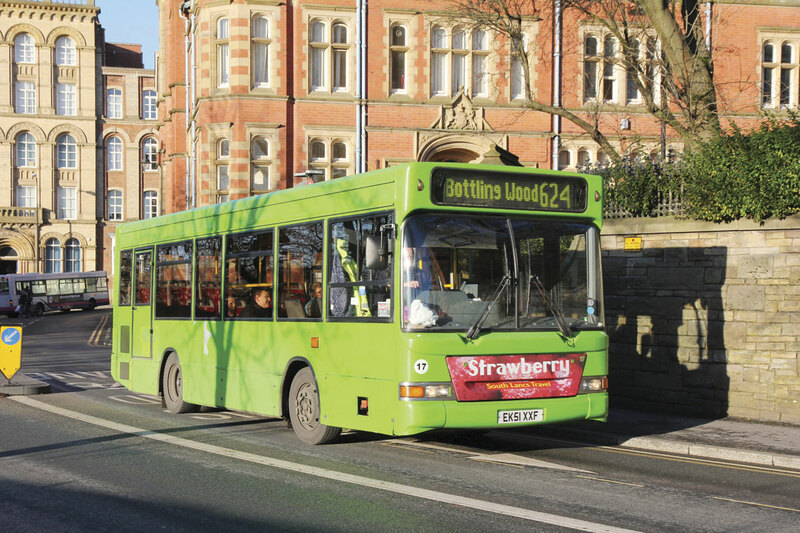 When Oliver Howarth left Blackpool Buses in 2009 David supported him in the process of the formation of Strawberry, a St Helens based bus operation, mainly through providing business advice. He subsequently supported it financially and ultimately it was combined with the South Lancs operation, with operations transferred to run out of the Atherton depot. 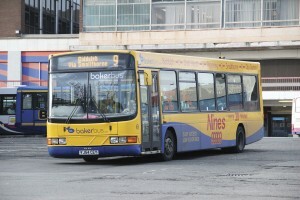 Prior to the latest acquisitions through BakerBus, the overwhelming majority of the main D&G fleet was made up of Optare Solos and Versas and ADL Dart SLFs and Enviro200s, though there are exceptions including a Scania OmniCity trio and some VDL SB120s with Wright and MCV bodies. 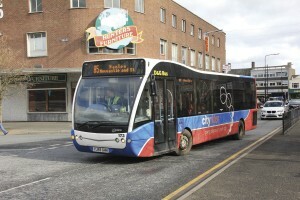 There is also a Volvo B7TL East Lancs Vyking that was formerly with South Lancs. 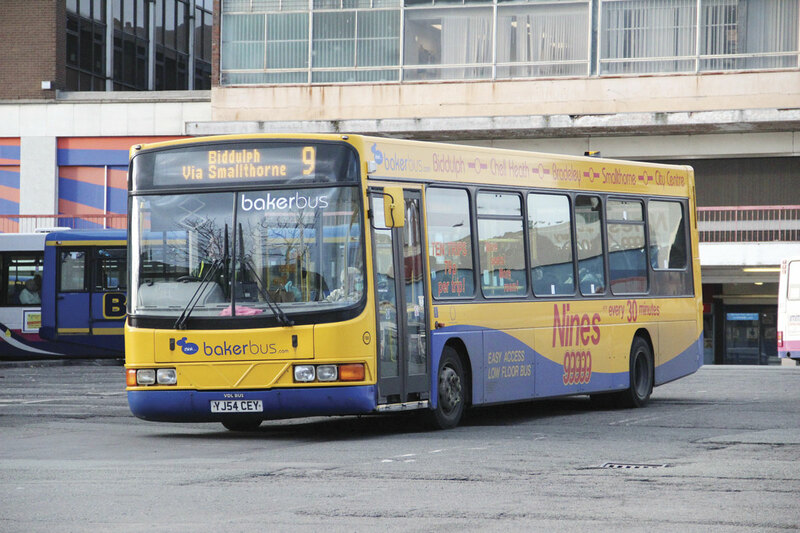 Excluding Bakers, which will have had a marginally positive effect, the average age of the fleet is eight years for D&G Bus and 9.4 years for South Lancs Travel. David anticipates that the size of the tendered bus market will get smaller in the coming years because the continuing pressure on council budgets will reduce the number of tenders. 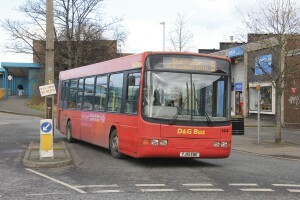 D&G Buses and South Lancs are a great advertisement for a deregulated environment. They provide tendered services more economically than a local authority could and to a high standard and have developed their commercial network without undermining other operators’ services. Passengers are the winners.